Remember the idiom “Being an early bird is better than being a night owl”. While this may not click factually, the idea is that in today’s competent software development scenario, it is really beneficial to test a software in the software development life cycle itself. Let’s evaluate the logic and the advantages for the same. • Planning the capturing and assessment of the requirements. • Freezing the requirements and analyzing them. Though this is a standard process, it may differ from project to project. If a project does not go as planned, the overall planning, analysis, design and coding takes more than the estimated time causing hurdles for the overall project planning. This happens in the situations where the project has to be delivered under the stringent timelines. In such situations, when the release date is frozen and there is no scope of flexibility, it results in immediate and massive impact on the testing and quality of the software or the application. At the same time, customers are being promised a robust application that determines the success of the entire project and ultimately the commercial success for the customer. Well, the only logical way out is to align the testing process way in advance of the development process. In such a scenario, organizations often witness a cultural shift with the Agile Development methodology and the DevOps. Whilst the DevOps bridge a gap between the IT operations and the development, the agile approach promotes progressive planning and development for unvarying enhancement. Furthermore, it emphasizes on keeping a quick and a flexible approach towards change. By the means of this approach, testing gets rooted into the system, which eventually helps in managing the defects quite in advance. In addition to this, it also offers a holistic approach towards the overall software development process. How can all this be planned? 1. Evaluate your test results: Ignoring the test results will ultimately help you in understanding the root cause of any ‘failed’ result and offer a solution at an early stage. 2. Expand the test coverage: When testing an application, it is advisable to maximize the testing process across the application. 3. Segment the Application Under Test: To draw the maximum of the testing process, it is intelligent to break the Application Under Test (AUT) into segments. 4. Writing test cases for better functionality: By putting down the test cases for valid and invalid conditions, it becomes easy to understand and cover the various behavioral facets of the AUT. 5. Start with the right foot: A tester should idyllically approach the project with an attitude to find defects, leaving no scope for error. Thus, the application gets tested in a foolproof manner. 6. Constantly share Test cases with developers: Instead of keeping to yourself, it is important to share the test cases with the developers before they start the coding starts. This will enable the coders in the development process and reduce the duplicity of work at a later stage. We often see that the developers are not equipped with the right test cases; so, this approach of sharing enables the developers with the same. 7. Performance testing for critical applications: It is recommended that the applications that need critical response should be tested from the onset. Here, performance testing comes to the rescue for such instances as against manual testing. • It allows the teams to understand the scope of work and the testing needs. For instance, only a small amount of items can skip the testing process, considering they won’t be impacted. • Testing at the requirement stage makes the process rational and cost effective. • Writing test cases in advance in the SDLC help solving them in due course. • It helps in quantifying the scope of the problem. • It further helps in preparing the test environment and prevents further delays, giving enough time to handle any unfamiliar risks. • It provides more time to the testing team, which does not compromise with the quality of the software or the application. When a testing process starts before time, it gets easier and cost effective to identify and address the bugs as it is cheaper to fix bugs at an earlier stage as against at a later stage. An Agile approach helps in getting feedback cycles by involving with the customers much in advance. Although there is a thin line unraveling the Agile & DevOps, the ones considering the Agile approach might be much more familiar with the DevOps. The agile principles can be implemented effectively in the development and quality assurance process, however, it is challenging to integrate it on the operational side. This is where the DevOps come into play to viaduct the gap. 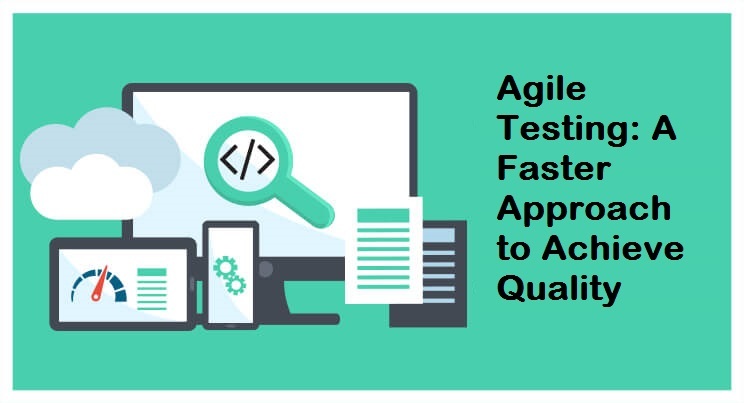 Are you planning to implement an Agile Test Automation strategy and looking out for a competent partner for quality assurance services? Seasia’s team of test automation experts would be excited to collaborate with you to build a robust and a tested strategy.